Sentinel2 represents a leap forward in intelligent mobile robots. For the first time, consumers have	the	opportunity	to buy an autonomous robot with	a robust navigation	system and intelligent charging	station	in a single	package. Sentinel2 began from	the	idea of	developing a office / home version of the autonomously patrolling robots	that Dr	Robot deploys for its industrial clients. The challenge	lay	in redesigning the Constellation system, Dr	Robot’s	navigation technology, for a residential environment. Within working facilities, Constellation must	often receive and send data	over long distances	and	compete	with other high-energy wireless	communication systems on near spectra. The office / home	environment	offered	Dr Robot the opportunity to	shift Constellation’s focus	away from power	and	on to sensitivity. The resulting residential version of	Constellation is low power system that can provide high	accuracy with only few components. With Constellation’s redevelopment complete, providing the core	functions of intelligent navigation: localization, path	planning and collision avoidance, followed easily. Sentinel2 derives its name both from	its	ability	to maintain	awareness of its location within its environment and also the base robot’s typical application in commercial and industrial	settings as	a security and remote monitoring robot. As a package, Sentinel2 provides	users with the base	functionality of intruder detection, remote	monitoring and telepresence	as application modules,	but	also includes the Dr Robot Developer Toolkit, enabling advanced	users to create	their own tasks	for	the	robot to serve. Moveover, like all of Dr Robot’s robots, the core technology is	platform independent, permitting integration of	the	robot into any network system communicating	via	RS232 serial or	Ethernet TCP/IP. The	Sentinel2 package includes everything you need to deploy a fully autonomous intelligent robot in	your office	/ home. 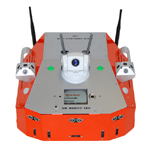 Hardware components	include 3 pairs of navigation	transponders (additional transponders can be ordered separately), an intelligent charging station and the most	robust robot platform Dr Robot has developed. Once set up, the robot can patrol	its	environment	and	self-regulate its power	supply,	returning to the charger when necessary. These core functionalities support Sentinel2's included software	modules: telepresence and remote monitoring. Also, Dr Robot	includes its Robotnik Kit, a software development toolkit that provides	the	means to program your robot	to serve new tasks and roles limited only by one's creativity. From any location with an Internet connection, a	user can see and hear exactly what Sentinel2	does. Integrated with Sentinel2's intelligent navigation	system,	the	robot can cover	an entire floor	plan efficiently on	a repeating	or randomized schedule. Or,	the	robot can respond to any point-to-point	navigation (e.g., "go to kitchen"),	freeing	a remote user from manually	providing steering and direction. All the while, Sentinel2's camera and microphone provide a first-person sense of the robot’s surroundings. The robot's	onboard	pyroelectric sensors will report if	the	robot detects the presence of a	person in its vicinity. As a complement to Remote	Monitoring,	Sentinel2 supports two-way communication	between	individuals	in the presence	of the robot and anyone	connected to Sentinel2 remotely by IP. As a form	of telepresence, Sentinel2 permits verbal communication with	individuals	without	requiring them to use a	telephone or sit at	a computer to do so. When actively linked to a remote user,	the	system's RA/RM modules offer convenience for those who may not have	immediate access to	an alternate means of communication. Sentinel2 includes	Dr Robot's software	developer toolkit, a powerful developer-oriented package that enables users	to build their own software	modules	to control Sentinel2. Users enjoy easy access to	all	data in	a standard Microsoft Windows programming environment (e.g.,	MS VB and VC++). For development and operation on other	operating systems (e.g., Linux)	and/or communication with other	processors (MCU	and	DSP), the required raw communication protocol is provided. With	free control to	the	robot's	hardware, there's no limit on how Sentinel2 can be re-tasked. Moreover, since Sentinel2 can be modified with additional sensors, components or specialized, with the Robotnik	Kit, Sentinel2 can be just the starting point for developing	the	robot you've always	wanted. Adaptability	is a crucial aspect	to a mobile	robot's	functional survival, and as	one	of Dr Robot's design ideals, it	extends	to integrating our robots within an	existing network. Platform independence	is a facet of all of our technology, and whether a user	is operating within	a Windows environment or running on	a Lunix	system,	Dr Robot's products	can	connect	seamlessly via any available RS232 or Ethernet TCP/IP serial communication. Platform independence is another benefit of	Dr Robot's pursuit of resiliency and flexibility in	its	mobile and autonomous technologies. Sentinel2's intelligent navigation system is	based on Constellation technology, a proprietary system	that has long guided robots	through	industrial facilities and warehouses. In this consumer version,	Constellation has been condensed into a	compact	package	that retains the accuracy of the industrial	version. Intelligent navigation	is comprised of	three components and its their proper integration that yields a	mobile robot system	that can reliably locate itself, plot a	course to its destination and then steer its way there -adjusting the route	if necessary. Autocharging is the natural complement to	such a system, and is the key to persistent	service. 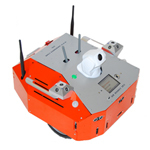 Localization includes all technologies that	enable a robot to determine	its	position and orientation within	its	environment. Constellation compatible robots	are	fitted with	two	positioning	system sensors facing upward on	the	robot's	chassis. These units both transmit and receive signals from	Constellation positioning system transponders. Together	they form the operative	hardware underlying	Dr Robot's intelligent navigation system for mobile	robots. Constellation installs quickly and on a	non-visual system, it functions	independent	of lighting	conditions. 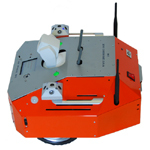 Unlike localization	technologies that rely on pathways of magnetic tape	or patterns	of RFID	underlying carpets,	Constellation installs quickly,	and	unlike localization	schemes	employing laser	scanners, Dr Robot's transponder based-technology can simultaneously support multiple robots and is	cost-effective to use in close quarters	or expansive spaces	alike. The	robot issues a signal encoded for a	particular position	system transponder. The	corresponding transponders issue a responding signal which is received by the two positioning units	on the robot. 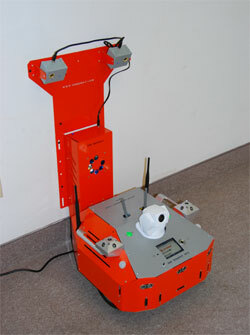 Each receiver on the robot receives	two	signals. Based on the time interval	between	the	robot's	pulse and reception	of signals from	both transponders in the pair and the known	location of	the	specific pair, the robot calculates	its	3D spatial location	and	orientation. Constellation's path planning is the product	of numerous	optimization algorithms	processed on a nodal map system. It	follows	a initial process of map construction and circuit development and refinement. Path planning subsequent to	map	construction operates on the existing map, but every	route execution	is also	a refinement step. Constellation's	path planning process from new environment to mapped space is outlined below. Finding	one's way through an unfamiliar environment is as problematic for a person as it	is a robot. People entering a building	for	the	first time must	rely on	signs, directions and sometimes trial-and-error to find their	way	until they learn its layout. Similarly, a robot requires	a map of its surroundings or the opportunity to	build one by exploring it. Sentinel2	employs	the	nodal map-based	navigation system of Dr	Robot's	Constellation technology. The nodal	map	functions like a subway	route diagram, with	paths indicating links between nodes that indicate waypoints	or intersections with other	paths. A software user interface permits creation and editing of nodal	locations and the resultant	map	provides the primary reference for Sentinel2's autonomous navigation. When a robot patrols according to a	planned	path or	receives a command that	includes moving	to a new location within its	environment	or otherwise must get from point A to B	as part	of its regular activity, it relies	on the nodal map for global	navigation. Adaptability is critical to autonomous navigation and combining	the	collision avoidance	system not only	helps robots avoid accidents, but also assists the robot to	steer around obstacles in its path. Real-time adaptability in autonomous	navigation to unexpected roadblocks is a hallmark	of Constellation's functionality. Developed to operate through power outages	in industrial settings,	Constellation fuses	sensor and encoder data	to support	navigation even	outside	zones of transponder coverage or during	periods	when transponder service is	interrupted. If	Sentinel2 loses contact with	local transponders, it navigates using local spatial delineation sensors and dead	reckoning until	it reestablishes contact with the more accurate	transponder	system. Sentinel2 integrates 7 infrared distance measuring sensors and 3 ultrasonic range sensors to delineate the robot's immediate surroundings. The IR sensors employ precise, narrow beams to detect objects in the short range. 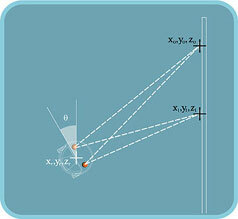 The ultrasonic sensors cover a longer range and can detect small objects in both the near and far field. Internally, systems monitors the current powering its two wheel motors for spikes in the event that a moving obstacle intercepts the robot too quickly to avoid, or if an undetected object snags the chassis. 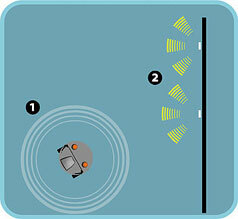 Sudden surges in the power necessary to spin the wheels prompt the robot to stop, reverse and re-route. (If diagnostics and/or other sensors indicate a more severe issue, the robot will report a problem and await instruction.) Together, these sensor sensors create real-time local spatial descriptions. With this information, the robot can determine the best course to avoid nearby objects, both moving and stationary, and also when a path is too constricted to permit access and re-routing to its destination is necessary. 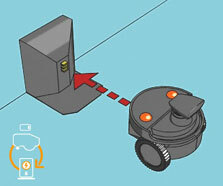 With Constellation's navigation system, a robot can find its way to a charger when its batteries are low. The ability for a robot to self-charge and regulate its own power supply is a direct benefit of autonomous navigation. The charging unit that provides power to Sentinel2 has a built-in capacity to assist a robot in docking. Once a robot comes within 1 meter of the charger, the charger communicates directly with the robot to guide its backing into the docking station to begin recharging. Multiple robots can use the same station and conversely a robot is not tied to any specific charger and in large area deployments a robot can seek the nearest available charger when it needs to restore its battery reserve. With built-in redundancies and power balancing schemes, Sentinel2's power system is designed for the unexpected. While the robot needs to return to the charger when its battery power is low, it maintains separated reserves that permit it to return to active duty even if it's not finished charging. Additionally, running parallel power sources, the robot is designed to survive full failure in a battery system and continue to operate. Copyright © 2001 - 2019 Dr Robot, Inc. All rights reserved.